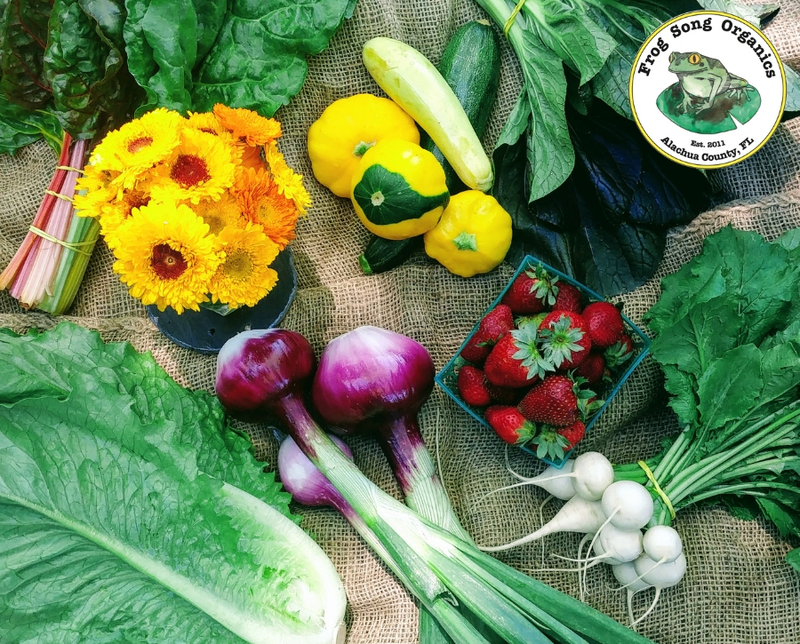 This Weeks Share Includes: First of the season Summer Squash, Rainbow Chard, Red Bok Choy, Tokyo Turnips, Romaine Lettuce, Sweet Red Onions, Sweet Baby Carrots (not pictured- ooops), Delicious Strawberries and Eye-Catching Edible Flowers- Calendula. Summer Squash- First of the season, our summer squash varieties include: yellow crookneck, Patty Pan and Zucchini. They are shaped differently but are all the same on the inside and cook the same too. Chop the patty pan (circular yellow squash) just as you would the other squash. These tender squash are delightful sauteed in butter or olive oil alongside the little white turnips in your share. You can also quarter them with the turnips and onions, spear them with a skewer, and throw them on the grill, Yay- Who doesn’t love Shish kabobs! Tokyo Turnips- Small and delicate turnips, tender enough to eat raw in salads or sliced in half and sauteed. Enjoy their tops in a salad or stir fry but make sure you give them a good wash before you prepare them. If you can’t cook them right away make sure to take the tops off, so they don’t shrivel up. Rainbow Chard- Rainbow chard, to much surprise isn’t an actual varietal of chard, but simply a mix of white-stemmed Swiss chard, red chard, and golden chard. When those three power players come together, they pack in a lot of flavor. As a result, rainbow chard has the intense mineral edge of Swiss chard the earthy sweetness of red chard, and the wonderfully mild nutty flavor of golden chard- The Spruce.Com. The most popular way to cook it and keep the beautiful rainbow color is to saute or braise it. Make sure to cook the stems first (about 3 to 5 minutes) giving them a head start before you add the tender leafy green so they will finish at the same time, roughly 8-10 minutes total cook time. Romaine Lettuce- “Muy Grande” shouts Lalo, chucking as he washes the giant romaine lettuce for our csa shares. Store this giant head of lettuce in a ziplock or bag, and wait until you are ready to eat it before you wash it, it will stay more crisp and fresh this way. Fire up the grill- If there were ever a lettuce variety perfect for the grill this is it. Read More about locally grown Romaine and why it’s safer than the alternative. Sweet Red Onions- This variety of sweet onions have a light red outer layer but taste just like the white sweet onions you’ve been receiving. they are perfect eaten raw sliced thin on top of sandwiches or in salads or sauté them to really bring out their sweetness.. and the greens too. Sweet Baby Carrots- Did someone say Carrot Cake? Every year around Easter I make my annual Easter Carrot Cake with none other than my most favorite, sweetest, carrots from Frog Song Organics. This year I get to decorate it with some beautiful calendula. Stay tuned for the results. Below are some of the recipes I have used in the past (coming soon). Strawberries- The beauty of our strawberries is that you can eat them right out of your CSA box. Unlike the majority of strawberry producers in the south, our strawberries are grown organically in the straw. This means we use straw mulch rather than the conventional black plastic and we use natural fertilizers like chicken manure and a boric acid bait sprinkled into the straw to deter bugs and other insects who want to enjoy the fruits of our labor before you get to. This year we did not spray our strawberries with anything at all, instead we took extra care in cleaning the field everytime we harvest strawberries so that there are no lingering or overly ripe berries enticing the various sweet-toothed creatures. Enjoy your grown-in-straw, strawberries. Calendula- Edible Flowers.The bright orange and yellow petals are edible and have a light taste like that of a cucumber. Toss them in your salads or sprinkle them over any dish to add color. The petals can be also be dried and used to replace saffron in cooking. Its medicinal properties match its beauty. The flower and its leaves are used for treating sore throat, mouth, menstrual cramps, cancer, stomach ulcers reducing fever and preventing muscle spasms. The flower can be used to make a healing salve that can reduce pain, swelling and treat poorly healing wounds. The flower is considered sacred.You may have seen the calendula flower decorating Hindu deities in India. Make sure to cut the stems about a quarter of an inch at the bottom to freshen up the stem and store in a jar of water. Change the water daily.